If you’re trying to attract high-end clients who are throwing black-tie events and are used to working with vendors and businesses that dress more formally, showing up to a wedding consultation in casual clothing is definitely going to leave a bad impression because they will feel like you don’t understand them and their event. However, if you dress super formally when meeting with a hipster couple who is looking to have a casual barn wedding, you’re likely to have the same issue as well. Identifying what appeals to your ideal client can help you know what’s best. Does this mean I can’t be myself or express myself? If your preferred appearance drives your ideal clients away, then you need to decide if you would rather change your appearance or start trying to attract clients that resonate more with your desired appearance. There’s nothing that says you have to work with only elite, high-end clients who expect a more formal experience. That’s the beauty of running your own business: you can target whatever type of clients you want and do what you want. You just have to recognize that it DOES matter, and that your appearance certainly does make an impression, whether good or bad. I’ve wanted rainbow hair for ages. I’m not really sure why, honestly. I just really love bright colors. 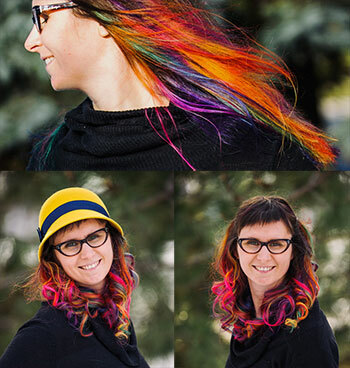 I couldn’t do it while working my corporate job as you had to have “naturally” colored hair if anything at all. Then once I got out and started doing this full-time, it didn’t occur to me that I could do it until about 8 months ago. But because we were just starting our wedding season at the time, I wanted to wait. I don’t think my clients would have really minded, especially since as artists we can get away with this sort of thing a bit more, but I knew I wanted it bright, and I didn’t want to draw too much attention since we really do try to be inconspicuous ninjas at the wedding. But then I saw a picture on Pinterest of longer hair with the ends dyed, and I realized that if I did something like that it could grow out naturally and I could pull it back and keep it less-distracting by putting it in a bun or something. So with several months until our next wedding and a plan, I decided it was time. I wanted someone that I knew would do a great job, so I asked around and was told that the best hair color stylist in Milwaukuee is Kelton Hatton. So I booked an appointment. I’ll share the entire story of what it was like to be pampered by 2 talented gay men for 10 hours in a salon in a future post, which is especially interesting considering I’m not their ideal client at all. But I was absolutely THRILLED with the results. We simply decided that having rainbow-colored hair would help us to stand out a bit more in a sea of photographers, and that our target client wouldn’t care either way (or would actually give us more credibility as artists). So far, business hasn’t changed at all and no one has seemed to have a problem with it at all. While we haven’t made it a huge part of our business branding right now, I updated all my profile pictures online, and we’re still getting interested clients despite the major change in appearance. But it’s still too early to know how it will affect the business. So I decided I’d ask a few readers and friends what their experience has been like. 1. What kind of body art do you have? 2. How much is your appearance a part of your brand, and how have you incorporated it into your business? It’s a big part of our brand the same way our lifestyle and personalities are. 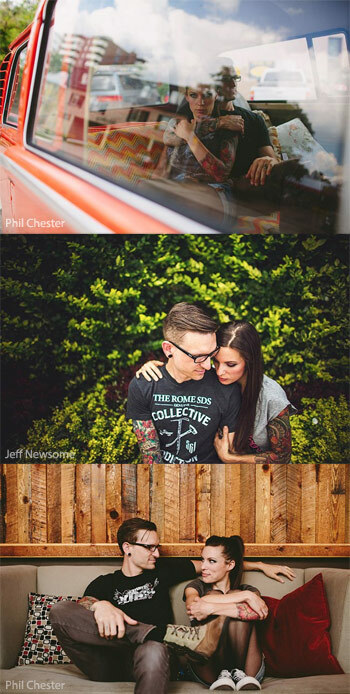 By showing our tattoos on our website it helps us target clients that are more outgoing, less traditional and a lot more fun for us to be around. We feel that it helps people get an idea of who we are quickly when they land on our site and it’s another thing to set us apart from the other photographers they may have looked at. 3. How has it been helpful or hurtful to getting new clients? We think we have definitely seen a lot more interest from the clients that are contacting us but we know that there have been a few people that haven’t hired us because either they or a family member of theirs isn’t okay with tattoos showing at the wedding. 4. Any other thoughts you’d like to share? Just like anything else about you, your appearance or your personality, when it comes to your branding you need to be 100% honest with your clients in who you are. 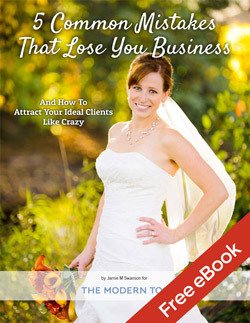 If you’re not you won’t get the clients that make the most sense for you and your business. I’m kind of known for my appearance. 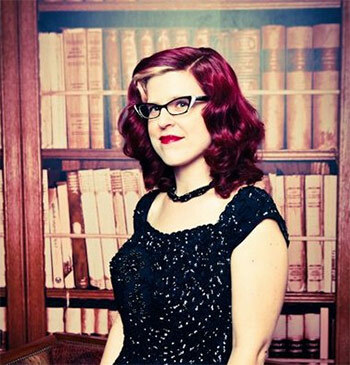 Very pale skin, green eyes, bright red hair with a blonde streak, vintage cat eye glasses with rhinestones, 2 nose rings, and generally very colorful vintage inspired clothes. No tattoos. I took the nose rings out. But the holes are still very visible as I’ve had my nose pierced for 22 years. In recent years, I’ve made a conscious effort to embrace my “look”, and not feel as insecure about it. I’ve even updated my company logo to include a likeness of me, which I’ve gotten a lot of really great feedback on. I didn’t want to use the same logo that everyone else had, some thing predictable. I wanted something that was uniquely “me”. I am pretty conservative when it comes to running my business, and have long been afraid that my appearance (while fine with family and friends) would inhibit people from booking me. In addition to weddings/event/portraits, I shoot corporate stuff, and magazine editorial, and would often feel particularly uneasy showing up to a shoot with A-list people, very wealthy people, celebs, or art directors and CEOs. Typically, they are much more conservative looking than me, and this worried me. I thought, they may not take me seriously. I (look) young (but am actually 38), I’m a woman, and I don’t look at all conservative or business like or “professional” (depending on how you define that word). I felt like I might lose booking a job, or have to work harder to prove myself, just because of my looks. On occasion I’ve worked with some high end clients, and sensed that I wasn’t treated quite the same as some of the other vendors. I often wondered if I had presented myself differently, more conservatively, if this would have made a difference. What I’ve realized though, is that my look IS my brand. Yes, people comment on how they love my personality. How warm and easy going I am, and fun to work with. And, of course, folks like my work. These factors all play into why people book me. But, I’m often referred to (and remembered as) “that funky red headed photographer with the pug dog”. I’m easy to remember, and easy to pick out in a crowd. I make a visual impression on people that is lasting, and I think that’s ultimately a good thing. I do live in San Francisco, which is known for being very open minded and liberal, so perhaps this has worked in my favor. While I haven’t had any negative experiences working with clients from other states, or abroad, I think that appearance could potentially play a factor if I was based in a very small or conservative town/state. While I WILL somewhat edit what clothes I wear according to the client (i.e am I doing corporate head shots, or shooting a benefit gala at the San Francisco Museum of Modern Art? ), I never specifically buy something for “work” that isn’t “me” and that I wouldn’t wear any other day of the week. My clients appreciate good photography, but can’t always “see” the difference between “good” photography, and “great” photography, the way a photographer’s trained and critical eye can. So, I realized, I can’t use the quality of my work/my point of view alone to distinguish myself. While it’s important to have top notch work, I think we need to differentiate ourselves in other ways. In addition to the more common areas of price, customer experience, specialty, and products, I think our personal “look” is one way we can do this. They say people like to hire people they relate to and feel similar to. I always thought this meant that only artist types with low budgets would hire me, and I’d never have the opportunity to work with high end clients. But, this has proven NOT to be the case. It seems my body of work, high end products, and tailored customer service is why people hire me, but my appearance is what helps people remember and refer me. This is particularly important when you’ve got a long, hard to remember name, like mine! 1. What kind of body art did you have, and how is it different from what you have now? I had bright violet streaks in my hair, and now I have brown hair with some caramel highlights. The cut and color shifts, but it’s natural-looking now. I think brand is a multi-faceted and difficult thing to measure. I’d say my appearance is a huge part of my brand, because people have to trust me to book, and then feel comfortable in front of my camera. I have always been committed to keeping my brand authentic to me, so that my appearance is a seamless part of it. It’s hard to quantify how my hair helped or hurt my business. I can definitely see a difference in the type of client that hires me now. Whereas I used to get a lot of young women who were new to their business or marrying younger, I now get a lot of women who are over over 40 professionals and brides in their 30’s. These women are so much more interesting for me to work with, and they have more money to spend. For me, the purple streaks were not a match for the kind of work I do. They weren’t bad, just set the wrong expectation. If my photography were edgy and modern, the purple streaks would work. My work is cosmopolitan and buttoned-up though, so my appearance needs to be that too. I didn’t think it affected my business negatively. It seemed to me like people loved to comment on my purple hair and everyone thought it was cool. One day I decided I was done with my purple phase and box-dyed my hair plain old brown again. Suddenly people started telling me that while the purple streaks were cute, it made me look young and that they didn’t take me all that seriously with them. Whoa. I was shocked to be hearing this after 2 YEARS of purple streaks. So, there you go. I’m certain your appearance affects your business. 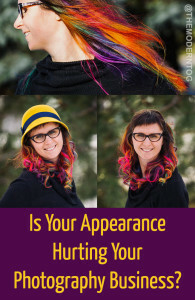 How do you think your appearance affects your business? Would love to hear your thoughts below, specifically about how much you think your appearance matters and if there are things that you do to change your appearance because of your business. Leave a comment and share!